• 8 digit handheld calculator. • Outstanding business and office calculators with a greener manufacturing process and reduced carbon footprint. • Large keys, large display and large answer bar. • Made from 50%+ recycled plastic. • Packaging made from 90%+ recycled paper. • Zero air miles during transportation. 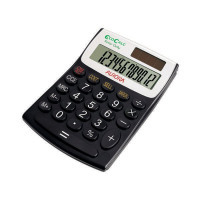 This ecologically sound Aurora EC404 EcoCalc 12-Digit Semi-Desktop Calculator is manufactured from recycled plastic and delivered in 90% recycled packaging with zero air miles for delivery. In addition to its environmentally friendly features, it is durable and reliable and makes working out large sums a breeze. With a wide, 12-digit display and large, easy to use keys, it delivers a user friendly desktop calculating experience that will make your work quicker and more efficient.